George Washington, also lovingly called the Father of our Country, lived between 1732 and 1799. 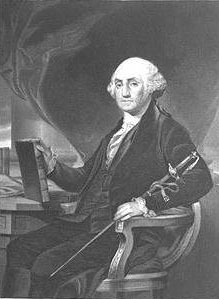 He is foremost remembered by: 1. commanding the Continental Army that won America independence form Great Britain during the Revolutionary War, 2. his role in directing the convention that wrote the U.S. Constitution, and 3. becoming the first President of the United States. Only 11 states made up the new nation when Washington first resided as President. He is perhaps the most admired and respected man in U. S. history. It is not surprising, when you glimpse through his life's experiences, and study the character of this remarkable man. He was a worthy leader and loved by his army officers. 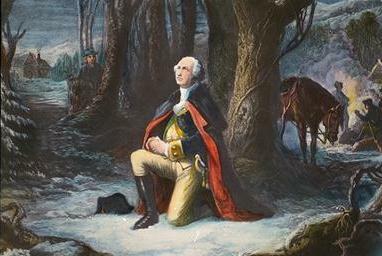 In a letter of instructions to his captains, Washington wrote, "Discipline is the soul of an army. It makes small numbers formidable; procures success to the weak, and esteem to all." In his own life, young George knew discipline well. His favorite subject was arithmetic. He wrote his lessons in ink on heavy paper. His mother made notebooks for him by sewing the papers together. When he was around fourteen, he read a book called Rules of Civility and Decent Behavior in Company and Conversation. It included 110 rules for being polite. He copied them all down in his own notebook. He had a detailed and elegant style of handwriting. "Cleanse not your teeth with the Table Cloth Napkin Fork or Knife," said one rule. "Be not curious to Know the Affairs of Others neither approach those that Speak in Private," another said. These were rules he took to heart, in the ways he conducted himself. He had respect for religion, was attentive, dignified, and dependable. He experienced hardships of colonial life, and learned that life was difficult. As a result he learned to be strong and patient. No other American has been honored more than he. Just look around the U. S. at all the places (and people) that have remembered him by his name -- Washington! Enjoy exploring our other pages!